Instead of a run-of-the-mill potato salad, try these grilled potatoes in a packet next time you have a cookout. They will compliment just about any meat, and your guests are sure to instantly become fans of the recipe. 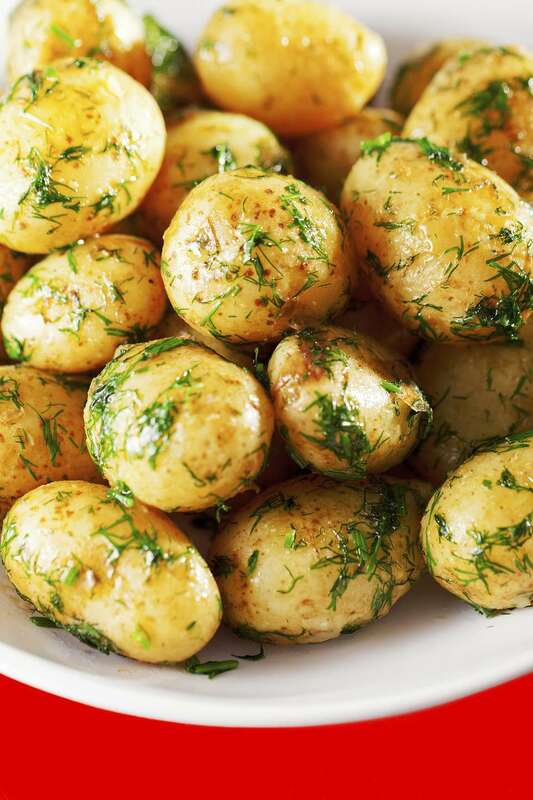 The potatoes are tossed with olive oil, melted butter, garlic, fresh dill, and salt and pepper and then wrapped in a foil packet and placed on the grill. The potatoes become soft and tender, with a little bit of crispiness on the edges. Delicious served warm or at room temperature. Wash potatoes, dry well, and cut into quarters. Place potato pieces in a resealable container or a zip-top bag. Mix together olive oil, minced garlic, chopped dill, melted butter, salt, and black pepper in a small bowl. Pour over potatoes, seal the container, and let marinate for 30 minutes. Preheat grill to medium heat. Using a slotted spoon, remove potatoes from container and place on a long sheet of aluminum foil. Pour enough of the marinade over potatoes to coat them well, but make sure they are not "swimming" in it. Place another piece of foil on top and crimp the edges together to create a packet. Make three small holes on the top of the packet to allow steam to escape while cooking. Place potato packet on the grill and cook for 30 to 40 minutes, or until tender. Remove packet from grill and let sit for about 5 minutes. Using heat-resistant gloves, carefully unfold aluminum foil, being mindful hot steam will escape. Transfer potatoes to a platter and serve. It is important that you don't add too much marinade to the foil packet—if you do, the potatoes will end up simmering in the liquid and will get mushy, and definitely not crispy at all. Just drizzle enough on to keep the potatoes moist while cooking. If you would like the potatoes to be a bit more crispy on the bottom, toward the end of cooking raise the heat a bit for the last 5 to 7 minutes. Shake the packet a few times to make sure the potatoes aren't sticking to the foil. This is a great recipe for altering to your liking, such as adding or swapping out different herbs like fresh parsley, rosemary, or chives. Make the dish a little more substantial by throwing in some thinly sliced onion and/or including diced red and green pepper. If you'd like to add a bit of nutrients and color to the dish, use a half sweet potato for the white potato. If you want to make the dish somewhat healthier, you can eliminate the melted butter and increase the olive oil by 2 tablespoons.